Rosehaven Cottage: It's Not Done, but I Have to Share! 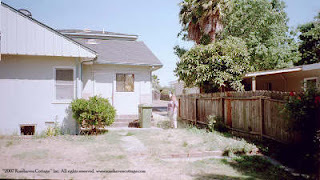 We bought Rosehaven Cottage a little over 7 years ago and it was in a state of neglect, needing lots of love and attention (that's why we could afford it in the Bay Area housing market). Never afraid of a challenge and with my mother's mantra "How hard could it be?" repeating in our minds, we dove into the project of a lifetime. The house and the gardens had good "bones"--firm foundation in the house; great soil and a white picket fence in the garden. We literally pushed up our sleeves the day after closing escrow, and they've not come back down very often over the past 7+ years. 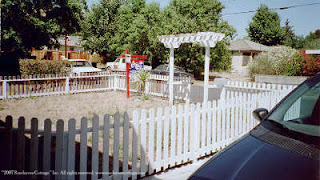 All photos above are what the gardens looked like the day we closed escrow. 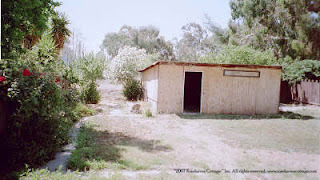 Our home and garden reside at the low point on the street with every other house in either direction being on higher ground. Fortunately, the county put in storm drains decades ago to handle the water runoff both at the front, middle and back of the property line we share with our neighbor. Typically, we don't get rain during the summer. Our heavy rains come in the winter. Around here rain can come in deluges that can wreak havoc on the garden if the water doesn't have some directional help (which is why I found old 3 foot high brick walls completely buried in soil throughout the back garden when I first started digging years ago). The good news is that we get lots of "free" top soil from neighbors. The bad news is that unless we handle the water properly is collects in our crawl space under the house and pools in low points throughout the garden. So our priority in our garden has been to provide hidden channels for the water to go from the high side of the back garden diagonally across the entire property back to the farthest low back corner where a storm drain awaits to carry the excess water away. Easier said than done when you want to have a functioning year-round produce garden. If you can't fight it, work with it. I put in a pond where the water seemed to collect anyway. I went out in the height of the January rains and started digging with a shovel. 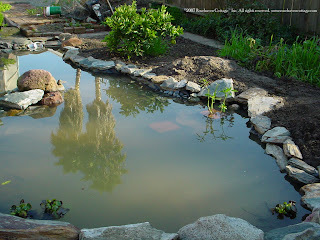 I moved the clay soil around as well as the muddy water that was collecting there until it "looked" right. 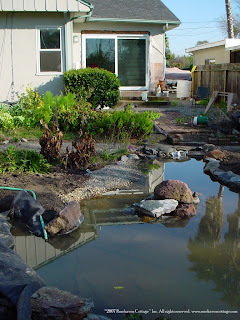 I used large rocks that I found all over the garden from the former owner (who had to be a rock collector because they are not indigenous rocks) to create borders around the pond and the gardening beds in the front garden. We took out all the concrete paths that were in the back garden and have reused the blocks of recycled concrete to build raised planter beds that I plant in produce and flowers according to the Square Foot Gardening Method and basic companion planting techniques (which means now pesticides!). 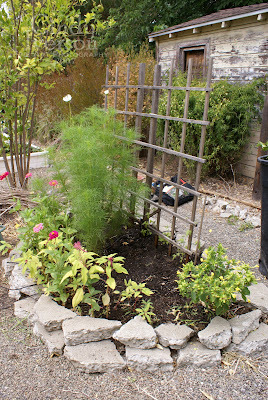 I put in pea gravel paths between produce and flower beds. The pea gravel paths hide a water diversion system for high run-off. Every winter, I go out during the peak of rainstorms and push the gravel around with a shovel to divert water and make it flow where I want it, make mental notes, and then when the rainy season is over I drop trenches in those areas that were problems the previous year and hide them with the well-draining pea gravel. My brother dug a major trench for me that is the beginning of the main trench system that is currently in the process of being installed by little ole' me. I will drop french drains in them and then mask the french drains with pea gravel and river rocks. So that brings me to what what I've been doing the past couple of weeks. I've been installing a flagstone patio that actually masks a large subterranean drainage system which diverts water down the major trench. I love rocks, I love dirt, and I love being in the garden, so this project has been so much fun! I let inspiration guide me each step of the way. Although the overall project is still far from being done, I wanted to share photos of my progress. Above: The new flagstone patio that masks a subterranean drainage area that flows to the river rocks you can see in the center of the photo. 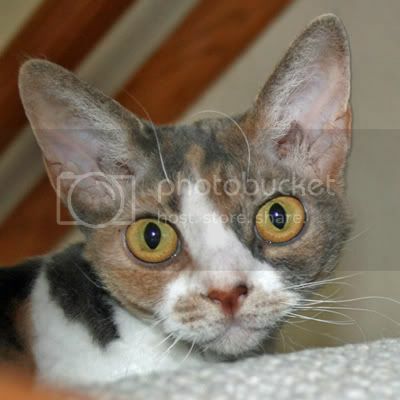 Click on any of the small photos above to see larger images. 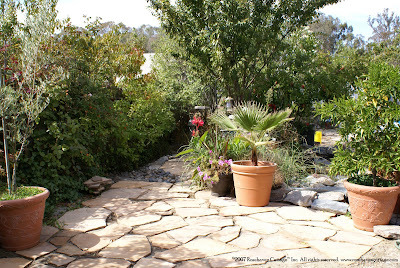 Above left: View of the new flagstone patio area looking down the trench that is now filled in with river rock to handle water when it rains. I have built what we call here in No. California an "arroyo". Above center: View from the back looking up the river rock trench toward new flagstone patio area. I've handled changes in elevation by building steps with recycled concrete blocks. Above right: View of my chair under the plum tree where I feed the fish in the pond. Now my chair sits level on a lovely flagstone terrace next to a planter made of recycled concrete blocks with a birdbath in it. Now its time to go play in the garden again and throw some more rocks around! It's absolutely gorgeous. I am so jealous, because I have no green in either of my thumbs! Keep sharing, as I will live my gardening life vicariously through you. You have done wonders with the garden. It looks so inviting now. Cindy, it looks like a true labour of love but one that repays the effort time and time again. Your garden is beautiful and the location allows you so much more varieties than we're able to grow here - so I am envious! I'm also envious of that great chef you have! You are just like a magical fairy you know? Even human doing things is not as fast as godness, but time will show human's magic~!!! And you did excellent work~!! I love what you have done with your garden so far. It looks lovely. Your pond looks great and so does the new patio. Good work with digging all those trenches and drains!!! You have vision to be able to transform the original space into such a beautiful garden. I love rocks too. Lizards hang out there! Oh Cindy I can not wait for my domestics to be done today so I can read all about the garden you created and sweet Tonm Tom! You asked how I was doing and I thought I would post some garden images today and a sweet poem to convey my feelings about this time of the year. Wow, what a change!! It's gorgeous! It is beautiful, a true work of art. Cindy, what a huge project you have undertaken, and what a transformation! 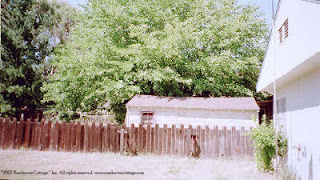 You must have lots of energy and determination to engineer your property on this scale! Kudos to you. Good thing your husband likes to cook...lol. Thanks for your nice comments at Brushstrokes, etc. too! Cindy - this is simply wonderful! I can't believe all of the work that went into this project! Great job! It's really beautiful.